Over the past two years, Senior Modification Expert Alan Wei has been working with Phuoc T to turn this 335is from just beautiful to beastly. This car has evolved significantly since we’ve been involved and helped get the car to its current state. Phuoc bought the car back in 2011 with exactly 16 miles on it, and since then has put 70,100 on it since. Purpose-built with the goal of daily-driving and weekend track capability, this white black and red ghost eats the apexes both on the street and at the track. While it’s significantly more powerful than a regular 335is, Phuoc’s chosen to keep the real power figure a secret. Power is simply described as “Adequate”, a la Aston Martin (who famously didn’t list horsepower for the longest time). It’s something we can appreciate. A stickler for the finer details, Phuoc’s gone through nearly every exhaust system on the market – in under a year. The car currently has a Vanguard V2 exhaust system, finally finding a sound that was right to his ears – and combined with a diffuser to fit. Alan was instrumental in helping Phuoc sort out the details for exactly the right fitment. 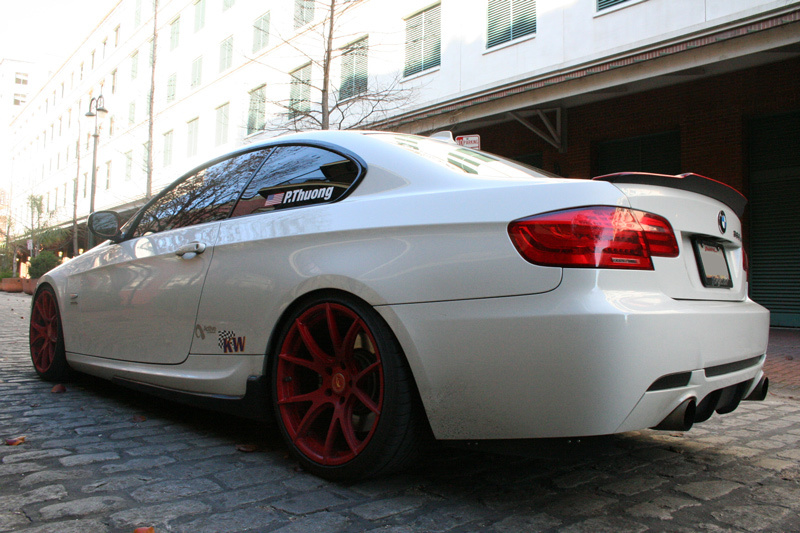 As we said earlier, the car sports a Vanguard V2 Exhaust System for E92 335, paired up with a custom diffuser. This creates not only a unique look but a great sound – we wish we could experience it echoing through the ancient Boroughs of Louisiana firsthand. 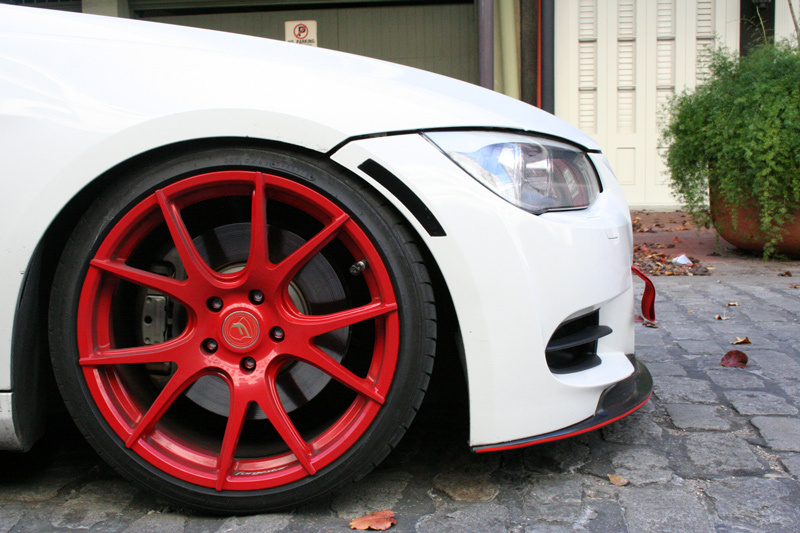 The aggressive look continues on the outside with a set of red Forgestar CF5V Wheels for BMW in 19×9 and 19×10 with Nitto NT555 235/35ZR19 up front and 265/30ZR19 out back. 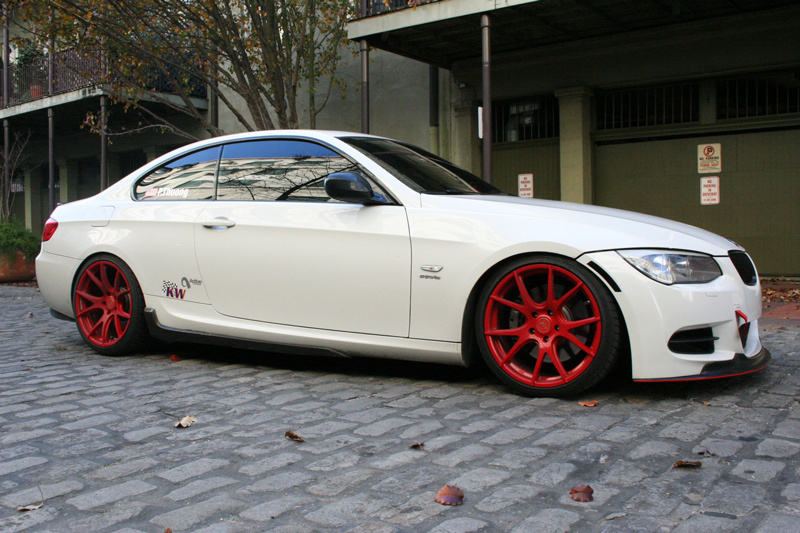 The car has a very clean and well defined white with red and black accent theme, with clever accent striping on the Exotic Tuning Rear Spoiler and running along the Arkym Aerosport Front Lip Spoiler for E92/E93 for added visual impact. 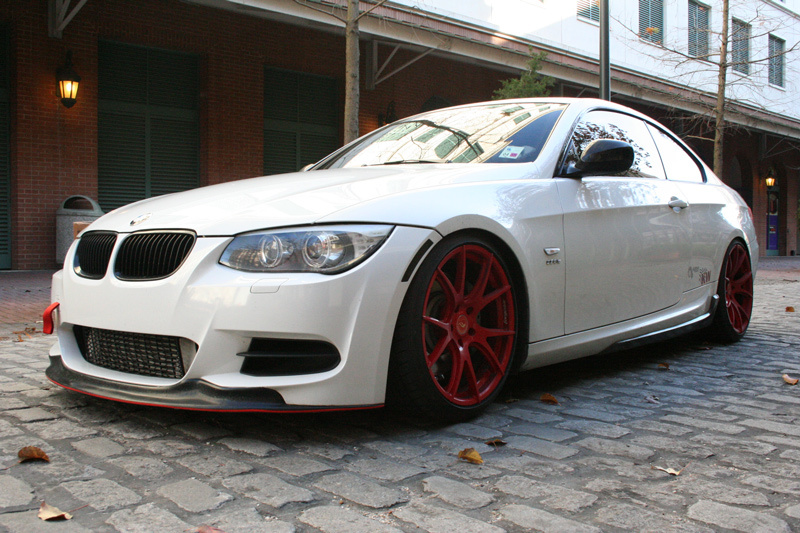 The Side Skirts feature an ACS Style Side Skirt add-on and are paired with custom Under-Splitters for an aggressive but functional look. That functional theme is repeated in the only interior modifcation – a BMW Performance Non-Electric Steering Wheel for something more comfortable to hang onto when throwing the car through the twisties. Delivering on the promise of its outward appearance, the car has some significant beef under the hood. 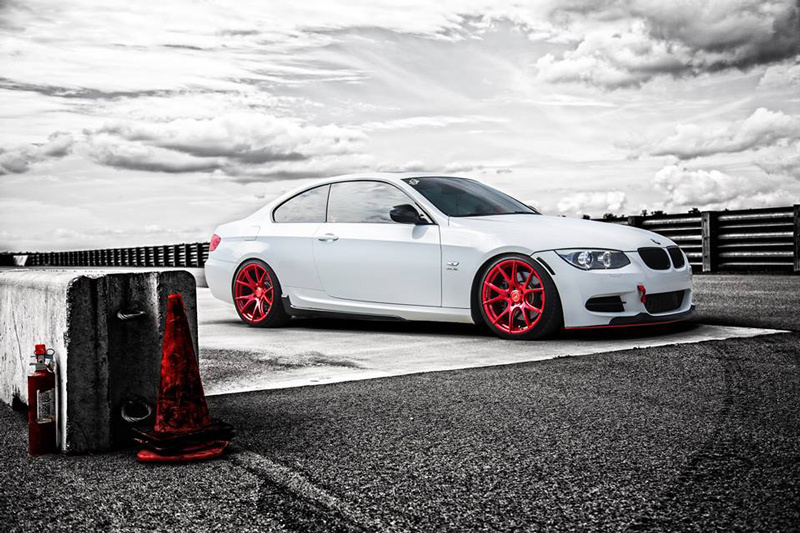 Freeing up the power BMW left on the table is a Cobb AccessPort V1 for N54 E92 335i– loaded with a custom Pro-tune by [email protected] Freaks. There’s significant work done to the intake system as well, cooling has been significantly enhanced by a Active Autowerke Front Mount Intercooler for 335i and Active Autowerke Blow-Off Valve/Charge Pipe combo for E90/E92 335i keeps things cool and is fed by aFe Stage II Dual Cone Filter Intake for E92/93 BMW 335is, supplemented by an AFE Silver Bullet Throttle Body Spacer for 335i to give the intake manifold runners a little extra length and clean up inbound airflow. Keeping that intake system and intercooler clean and free of oil is a BMS Oil Catch Can for N54/N55 Engines. Managing the flow out of the N54’s twin turbos is a set of AR Design Catless Downpipes to decrease spool-up times as well as improve throttle response – and of course, increase overall power. The suspension has been worked over as well, riding on a set of KW V3 Coilovers For E92 to give this beauty the perfect ride height as well as the adjustability to ride comfortably day to day but the flexibility to dial it up when it comes time to hit the road course. All these things combined makes the N54 under the hood especially muscular, certainly more than enoughso to surprise an M3 not paying attention to the details. The combined package creates an aggressive but focused look, simultaneously loud and subtle at the same time and with the functionality to cash the checks written by its aesthetics. a call at 714-582-3330 x8006 or any of our Modification Experts can assist you. We look forward to seeing this beast on the track sometime and applaud Phuoc’s clever design scheme and clear focus on the finer details for a gorgeous end result.